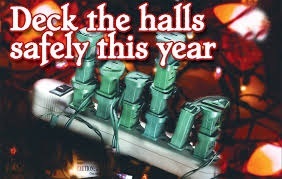 l Keep your tree away from fireplace and other heat sources. l Place the tree away from heavy traffic areas. l Buy only fire-resistant artificial trees. l Anchor the tree firmly to the stand. l NEVER use lighted candles on the tree. l Outdoors, use only lights certified for this use. Wishing everyone a very merry and safe Christmas! !